China's solar PV capacity is glutted or just "crying wolf"? China added 53 GW of solar PV capacity last year, hitting a new high of expansion in the sector. The expansion spree inevitably makes people wonder whether the country will be stuck in the overcapacity dilemma or just "crying wolf", especially facing the possibly shrinking domestic demand in 2018 and trade risks in the overseas markets that have showed signs. "We need to be very careful about the overheating issues in the sector," warned Wang Bohua, secretary general of China Photovoltaic Industry Association. "We build too much capacity now, from the upstream polycrystalline silicon to the downstream solar cells." Overviewing China's solar PV development these years, however, every overcapacity crisis seemed to be the false alarm, and the market absorbed most of the capacity at last. "Supply shortage of PV modules in the past two years spurred producers made lots of expansion plans," said Peng Peng, secretary general of China New Energy Investment and Financing Alliance, "If the increase can be maintained at 50-60 GW this year, the overcapacity issue is still acceptable." 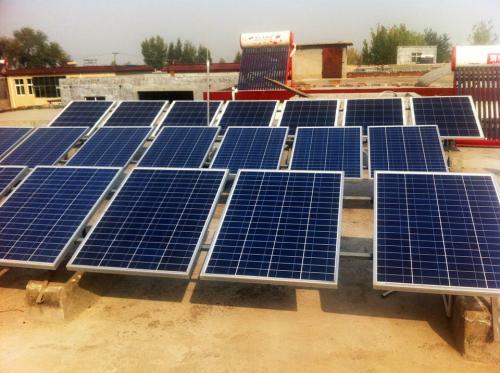 "The solar PV market is not the truly free market," said Zheng Hongwei, head of China Institute of Energy Economics. "Subsidy policies of home and abroad play a big part in the market." In 2011, the year when the global solar PV capacity was most glutted, solar PV supply totaled 70GW in the world, dwarfing the demand of 27.5 GW. With a series of subsidy polices taking efforts in China, the US and Japan, the supply-demand relationship had been balanced. "I support capacity expansion, but not in a large-scale way," said Wang Shujuan, a senior researcher in the industry. "Technology update is so fast in the sector," she added. "If the installation grows too fast, the old capacity will become the burden to drag down enterprises' development." Although the old technologies aren't phased out immediately and needed in low-end markets, it still squeezes the living room for small and medium-sized enterprises, which don't have enough funds to upgrade technologies. A small PV company made a good profit of 8 million yuan in 2017, but chose to sold its facilities and quit the market at the end of the year when the industry introduced new producing lines. "If we don't change the producing line, our products will loss the competitiveness," the company said. "But the new line costs us about 10 million yuan, we can't afford it."